Lower Antelope Canyon Page, Arizona When people ask where my favorite place to travel is they’re often surprised when I don’t answer “abroad” and instead tell them the Southwest might be my favorite place to visit. Every time I head to Utah and Arizona I’m just blown away. 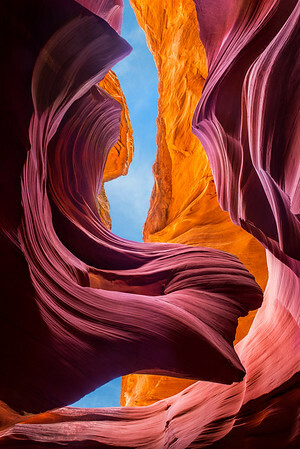 Antelope Canyon is one of those amazing places that leaves you speechless every time you visit. I’ve visited this slot canyon several times yet there’s always something new to see and explore. I’ve wanted to get this shot for quite some time but just never made time for it until this trip. With some time to kill on a cloudless morning, Willie, Breezy and I meandered the slot canyon for an hour by ourselves before the place became overrun with tourists. The rock formation on the left is known as “Lady in the Wind”. Can you spot her head, torso, and flowing hair? Standing underneath her, looking up at the sky creates quite the dramatic scene. I’ve photographed the Lady twice before from different angles and of the three I love them all for different reasons. Warning: We were in for a bit of a shock when we arrived. As we waited for the canyon to open we noticed that there were 2 new, fancy, buildings at the entrance. It turns out that a new, and quite awful, company opened shop at Lower Antelope Canyon called “Lower Antelope Canyon Tours.” They are not the original tour company and they may even be operating illegally. They led us false information (for example: they claimed that the photography tour had to be a guided tour that started 1.5 hours after the canyon opened, well after the light would become harsh and horrible and that un-guided tours are no longer allowed). We went over to the original, Ken’s Tours, and were able to head into Lower Antelope Canyon unguided. We had the whole place to ourselves for almost an hour. After that is when things went downhill — it became so crowded I couldn’t even move. When I reached the end and wanted to turn back my only option was to climb up, out of the canyon, walk to the beginning from above, then climb back in to nab a few more shots. Lets hope they don’t over commercialize Lower Antelope and turn it into the zoo that Upper Antelope is. Nikon D800 w/Nikkor 24-70mm f/2.8G ED AF-S: 24mm, f/11, 1 sec, ISO 100 Exposure and focus stacked for increased dynamic range and depth.